Surging investment in almost every sphere of European ro-ro operations, with the accent on higher capacity, more energy efficient and environmentally compliant tonnage, indicates a powerful rebound of the sector, against the backdrop of overall improvement in freight volumes and financial performance. The industrial effect of the current scale of modernisation and development of shortsea ro-pax and ro-ro fleets is magnified by the attendant demand for design, equipment and engineering ‘tailoring’, resulting in comparatively high production values and capital intensity. Further impetus to the implementation of newbuild schemes was afforded by IMO’s confirmation in April this year of a 20% correction to its Energy Efficiency Design Index (EEDI) calculation formula for ro-ro and ro-pax vessels, assuring a much needed margin for projects inhibited by the previous, problematic EEDI criteria. Home-grown technical know-how underpins newbuild programmes, irrespective of where ships have been ordered. Notwithstanding fresh contractual successes in the European market by leading lights in ro-ro construction in Germany, Norway and Croatia, the emergence of Chinese yards as facilitators of European ferry fleet renewal programmes is especially significant. European rejuvenation is accompanied by a new wave of consolidation in the sector, exemplified by the impending amalgamation of Spain’s two largest operators through the Naviera Armas takeover of Trasmediterranea, and by the DFDS acquisition of Turkey’s pre-eminent ro-ro freight company UN Ro-Ro. 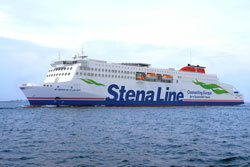 The Stena Group is renowned for its skill in developing and operating new designs of shortsea ro-ro ferry conducive to series production, lower unit costs and adaptability to differing service routes and demands. The latest stage in its contribution to the advance of ro-pax technology is encapsulated by the nascent E-Flexer series, dimensioned for 3,100 lane-metres of freight and up to 1,000 passengers. Economies of scale in conjunction with the most circumspect consideration of power, propulsion and underwater design issues promise a class of ship offering about 25% less CO2 per freight unit than existing ferries, plus the wherewithal to meet exacting criteria regarding NOx and SOx emissions. The Swedish group initially identified a requirement for eight vessels of the new generation, and moved a stage closer to realising that objective in mid 2018 when a sixth E-Flexer was ordered. It subsequently exercised options on seventh and eighth, larger newbuilds and laid the ground for an even more extensive programme by taking out options on the construction of four further E-Flexers. The entire series has been placed with the AVIC Weihai yard in China. Deltamarin, the Finnish-founded technical consultancy arm of the contractor’s parent AVIC Group, developed the design and is supplying the comprehensive engineering, procurement, construction and management (EPCM) package. The seventh and eighth E-Flexers will be some 25m longer than the first six, giving an increased maximum payload of 3,600 lane-metres and 1,200 passengers. Rather than the more usual four-engine layout in a ferry of this size and type, the E-Flexer has a two-engine installation, in the form of a ‘gas ready’ plant based on two MaK 12-cylinder VM43C diesels, to ensure a speed of 22knots. MaK’s dual-fuel technology can be applied by converting the machinery to the M46DF model. Operating in gas mode would achieve IMO Tier III compliance, while the ‘future-proofing’ measures adopted in the E-Flexer include options for retrofitting scrubber plant or selective catalytic reduction (SCR) systems. E-Flexer deliveries are scheduled from early 2020 onwards. The first, second and fourth newbuilds in the series from AVIC Weihai will be allotted to Stena Line’s Irish Sea network, while the three other firmly-booked vessels have attracted long-term charter deals from other prominent players in the north European ro-ro market. DFDS has signed a 10-year charter on one of the newbuilds, to be phased into service on the Strait of Dover in 2021, while Brittany Ferries has secured two of the ships on respective five- and 10-year bareboat charters for the long-haul routes connecting Portsmouth with Santander and Bilbao. Meanwhile, the ro-pax earlier ordered by Brittany Ferries to its own account at Flensburger Schiffbau-Gesellschaft (FSG), and due in the spring of 2019, will break new technical ground in the cross-Channel market on two counts, through the nomination of electrical propulsion and the selection of LNG dual-fuel engines. Arranged for 1,680 passengers and 550 cars plus 64 trailers, or an all-freight ro-ro payload of 130 trailers, the 42,400gt Honfleur will replace the 1992-built Normandie on the Ouistreham(Caen)/Portsmouth service, the Breton company’s busiest route. The southern Baltic is the setting for an initiative whereby Polish Steamship Company (PZM) subsidiary Unity Line is planning a series of shortsea ro-pax ferries of novel design, incorporating a hybrid powering system featuring wind generators. The vessel concept has been devised by the owning group and operator in cooperation with Wärtsilä and the Gdansk-based firm of consulting naval architects NED Project. The proposed design incorporates LNG dual-fuel main machinery and electric propulsion motors, augmented by banks of batteries charged by four vertical wind generators mounted towards the stern. Up to four newbuilds could be involved, the first of which would be assigned to the longstanding service between the western Polish port of Świnoujście and Trelleborg, at the southern tip of Sweden. The basic configuration offers a 3,600 lane-metre ro-ro intake plus 521 passenger cabin berths within main dimensions of 204m x 31.8m, although the design lends itself to longer variants up to 225m. The envisaged four-engine layout would employ Wärtsilä 6L50DF prime movers, each rated at 5,850kW, while the four vertical rotors are expected to deliver up to about 1,200kW in strong wind conditions of 20m/s. Besides the commitment to one of the E-Flexer series, DFDS has augmented its own newbuild programme this year, entrusting three more ships to Chinese builders. Guangzhou Shipyard International has been awarded two 4,500 lane-metre/600-passenger ro-pax ferries, for the Baltic route network, and a fifth 6,700 lane-metre/500-trailer ro-ro has been placed with Jinling Shipyard. Cobelfret-associated Compagnie Luxembourgeoise de Navigation(CLdN) put down a new marker for intra-European logistics last October through the introduction of the 74,300gt Celine to routes linking mainland Europe with Ireland and the UK. Laid out for 7,800 lane-metres of rolling cargo within main dimensions of 234m x 35m, Celine is claimed to be the largest shortsea freight carrier built to date. She was followed by second-of-class Delphine from South Korea’s Hyundai Mipo Dockyard (HMD) early on in 2018. Complemented by the expansion of terminals run by sister company C.RO Ports, the new breed offers flexibility as to service allocation, and provides importers and exporters with greater scope for direct Ireland/continent routings as an alternative to using the UK ‘landbridge’, an option which may gain in relevance following the UK’s secession from the EU. The Celine type is powered by a single, MAN two-stroke ME-series engine, rated at some 18,600kW, driving a Rolls-Royce controllable pitch propeller, and carries the ‘gas ready’ class notation from DNV GL. Five Kawasaki tunnel thrusters, three at the stern and two in the foreship, provide exceptional ‘crabbing’ capabilities. CLdN has also ordered a quartet of 5,400 lane-metre ro-ros from HMD for delivery through 2018 and 2019, and two ships of similar capacity are in hand at Croatia’s Uljanik Shipyard, which holds options on several further vessels. Italy’s expansion-minded Grimaldi Group has this year implemented a considerable newbuild programme revolving around a ro-ro trailership design on a par in terms of capacity (7,800 lane-metres) with CLdN’s Celine, but slightly longer at 238m and with a beam of 34m. Dubbed the GG5G, or Grimaldi Green 5th Generation, the design has been developed by the shipowner in conjunction with Knud E. Hansen of Copenhagen and features hybrid powering arrangements. The initial tranche of six vessels was contracted with Jinling Shipyard of China in April, and a second batch of six was firmed-up the following month. Total investment is in the region of US$800m and spans deliveries from 2020 to 2022. Nine of the ships will be operated by Grimaldi Lines in the Mediterranean and three vessels of a modified version will be deployed by sister company Finnlines in the North Sea and Baltic trades. The scrubber-equipped ro-ros will burn heavy fuel oil (HFO) during navigation, and the energy requirement when alongside will be met using lithium-ion batteries. The batteries will be recharged while under way via shaft generators, supplemented by 600m2 of solar panels. The other main technical innovation to be embraced by the GG5G trailerships will be an under-hull bubbling system reducing frictional resistance and saving fuel. The ro-ro mode has also been championed in a further Mediterranean endeavour jointly launched by Italy’s Onorato Armatori and the Swiss-headquartered MSC Group, which also has Neapolitan roots. The deal signed in early 2018 with Guangzhou Shipyard International and China Shipbuilding Trading Co (CSTC) encompasses four ro-pax vessels to cruise ferry standard, plus four options. Due from 2020 onwards, the ships will be of 229.5m length overall and 32.2m breadth, and will be fitted out with 534 cabins. A service speed of 23.5knots has been specified, and the engineering design will be to ‘LNG-ready’ class stipulations. The first and third ferries in the series will be allocated to Genoa-based Grandi Navi Veloci (GNV), while Onorato, whose interests include Moby Line, has been assigned the second and fourth ships.